Plenty of inexpensive wedding rings are out there. The challenge though is to find rings that are durable, made with excellent craftsmanship and which fit the style of your dreams. To find out how you can find the perfect affordable wedding rings that will last a lifetime - for the right price - just use these tips and recommendations below. 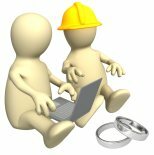 And if you have any questions at all about rings that may have caught your eye, need a second opinion, or you would like to share pics of your affordable wedding rings with our visitors, use the handy comment box is at the end of the page! Fun Fast Tips for Inexpensive Wedding Rings! To get the most bang out of your bucks, consider purchasing gently used rings. Rings crafted with beautiful gemstones, instead of diamonds, can dramatically lower the price of rings. For affordable men's wedding rings, consider inexpensive durable metals including tungsten and titanium. 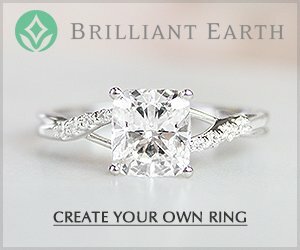 Inexpensive Wedding Rings - Where to Start? The best place to start when you are looking for affordable rings to fit your budget, and taste, is with style. If you are open to unique types of wedding ring styles, a lot more choices are available - including gemstone wedding rings and rings made with contemporary metals like tungsten, titanium and cobalt. There are plenty of cheap wedding rings out there - but many of them are, sadly, not made with durability and longevity in mind. And couples that need to save money on their rings can sometimes end up spending more if they need to pay costs for replacing the rings down the road, replacing lost stones or repairs. Palladium Wedding Rings which are often more affordable than white gold. 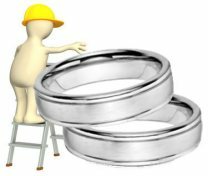 Tungsten, titanium and cobalt are excellent options for Discount Men's Wedding Bands, and for modern women's engagement rings. But because these metals are so strong, they cannot be crafted into traditional women's wedding ring styles so design selections in these metals are somewhat limited. 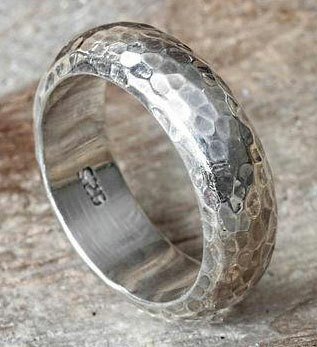 Silver is an excellent metal for inexpensive wedding rings - but make sure you stick with Sterling Silver Wedding Rings. And, because silver is such a popular metal for low cost rings, you'll want to make sure the rings are made with good workmanship. Look for handcrafted bands that have a solid weight and thickness to them and which are backed with a guarantee. (Silver rings do need special care, but if the rings are made by a skilled hand they can be quite durable). Palladium is an excellent metal for wedding rings in a medium price range. Palladium Wedding Rings are often priced lower than gold, and are definitely more affordable than platinum rings. An extra plus with palladium too is that the beautiful white color of the metal does not require any need for rhodium plate - unlike white gold. Rings made with 14k gold are another terrific option - although any type of white gold will need to have a new rhodium plate applied about every one to two years. If you would like to forgo the rhodium plate, consider 14k rose gold rings or traditional 14k yellow gold rings. Although many 10k gold rings are available for lower priced wedding rings, couples need to take care when shopping for 10k rings. Too often rings made with 10k gold are made with shoddy workmanship and are extremely thin - for long term durability, it is best to stick with the metals listed above. What about Affordable Diamonds and Gemstones? Take a look at our page about Inexpensive Engagement Rings! You'll find the best options for affordable diamond rings and affordable gemstone wedding rings - plus really important need-to-know info about diamond simulants and synthetics that will ensure you find a quality made ring with a center stone that will last. One very important tip for any ring is to avoid any type of plate - with rhodium plate being the one exception. Beware of brass bands plated with silver, silver bands plated with gold and decorative black plate on titanium and tungsten rings. Remember, any type of plate on a wedding ring is less than the width of a human hair - and plates will often begin to chip and wear away within a matter of months with every day wear. (A new fad that has been appearing lately is silver plated with rose gold, again - the beautiful rose gold plate on these rings will wear away quickly). Stick with retailers (and you'll find our recommendations below!) that offer rings made with a return or exchange guarantee and certified diamonds. When shopping for rings, take time to comparison shop and note that many online wedding ring retailers can offer substantial savings compared to brick and mortar stores due to reduced overhead. Costs for rhodium plate applications can add up over the years - if you want to save money over the long run, stick with rings made with yellow/rose gold or with palladium, silver, tungsten, cobalt, stainless steel, or titanium. Flexibility on style can really save you a ton on wedding ring prices - especially if you are open to contemporary styles and rings made with gemstones instead of diamonds. Even affordable diamond rings need to come with a diamond certificate from a reputable laboratory. This certificate is your only guarantee that the diamonds are real - additionally, uncertified diamonds make up the largest portion of the conflict diamond market. Ideally, diamond certifications should be issued by either the GIA, AGS, IGI or the EGL. Now for our best recommendations on quality, affordable rings! 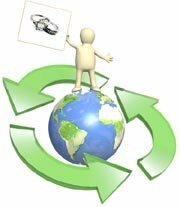 Used Wedding Rings on Ebay are a terrific source for quality used wedding ring sets and used designer rings, just remember to only buy from sellers which offer a refund policy, any diamond rings should come with a certificate from a reputable laboratory like the GIA, AGS, IGI or EGL. To make sure you have purchased a real diamond ring, have the ring evaluated by a local jeweler. For cubic zirconia rings, you can also find Stainless Steel Cubic Zirconia Rings on Ebay. 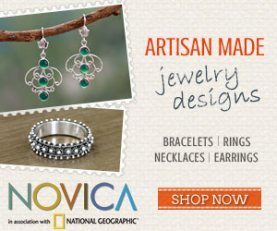 Novica has a beautiful selection of quality handmade rings, and most of their rings come with a 60-day refund policy. Here you can find sterling silver rings, gemstone rings and beautiful silver wedding bands. Overstock has a great selection of Cubic Zirconia Silver Wedding Ring Sets and Moissanite Rings. 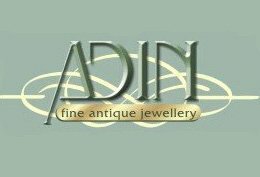 Shop with caution here though, while there are many quality rings on this website there are also less expensive styles - in 10K gold or plated rings - which are not made with the best workmanship. 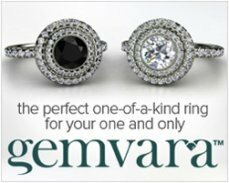 Gemvara carries an amazing selection of gemstone engagement and wedding rings in a huge range of prices....some even in the under $500 dollar range. 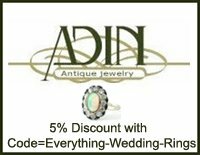 And these rings are handcrafted and backed with a guarantee. 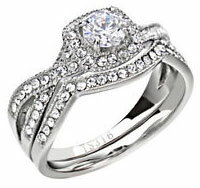 You will also find a large selection of moissanite rings. Plus, Gemvara has an easy to use shopping system where you can quickly sort out ring styles by your price range. 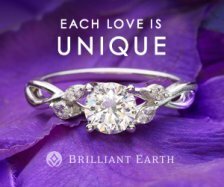 Brilliant Earth has a gorgeous selection of moissanite engagement rings and wedding ring sets available in 14K rose and white gold and platinum. Titanium Kay is one of the best resources for affordable, high quality Cobalt, Tungsten and Titanium Rings - and here you can also request laser engraving on the outside or inside of the bands, a wonderful option for couples looking for matching wedding rings. 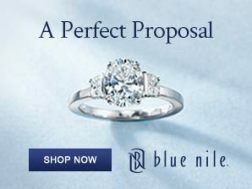 We sincerely hope that the info here will help you to find the perfect ring for the right price! And remember, if you have any questions, comments or would like to share pics, just use the comment box below. Do you have questions or comments about inexpensive wedding rings? Send in your questions and comments, or share pics of your gorgeous and affordable wedding ring here! Cubic Zirconia Bridal Sets on Ebay! Check-out this selection of quality affordable engagement rings! 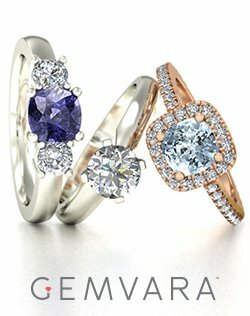 Inexpensive Gemstone Wedding Ring and Silver Wedding Band Picks by Gemvara!